Mikaylah Simone is a rising new poet whose simple, yet visceral, style brings poetry back to its basics as a social art through her affirmation of cultural identity and personal redemption. 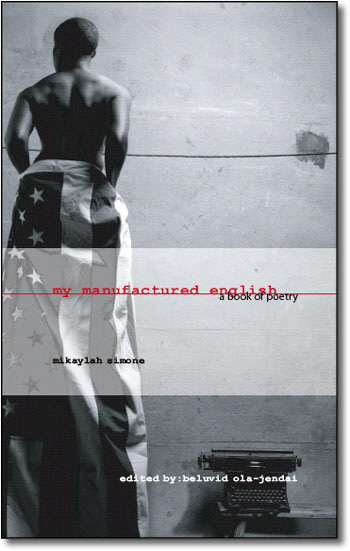 My Manufactured English: A Book of Poetry (Trafford Publishing; ISBN 1-4120-3211-3; $16.75 paperback), by Mikaylah Simone is a socially relevant collection that not only solidifies her as a traditional poet, a Âweaver of wordsÂ if you will, but a collection that celebrates her impressive revelatory view of life and mankind. Mikaylah Simone is an emerging African-American poet whose provocative poetic style communicates consciousness and passion born out of a strong desire to transform her thoughts and life experiences into art. The blending of her Swahili roots with modern issues in pieces such as, ÂBelly FullÂ and ÂConsciousnessÂ along with ancestral platforms found in ÂSankofaÂ and ÂMajiÂ provide readers a deep appreciation for her melancholic eyes when she remembers the past and her luminous voice for the future. This premiere work includes chapters of penetrating poetry focusing on varying themes and layered meanings of politics, religion, violence, community and the complexity of love - all revealing the fresh insight of this author's journey that is honest, sad, comical and true. MikaylahÂs brand of poetry is certainly reaching the masses, and reviewers have found her work to be dynamic, compelling and stimulating. Praise for My Manufactured English . . . Awards and Recognition for Mikaylah Simone . . . .